...for most players, this is the new ace card for Gold Paladins or at least for Liberator players. Like almost every Grade 2 Blaster unit, it's Grade 2; 9,000 power and a certain retirement skill that requires 2 Counterblast. 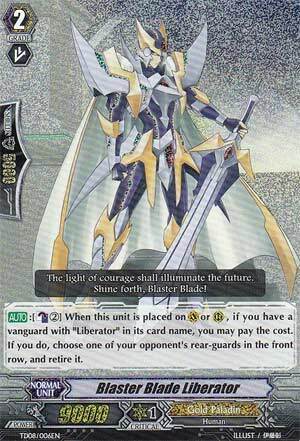 For Blaster Blade Liberator, whenever he's placed onto the field, you can Counterblast 2 to retire ANY front-row unit regardless of Grade. As a pro, this is excellent seeing how he can retire any unit that's in the way regardless of Grade and also the fact that it works whether he's placed as Vanguard or rear-guard. However, as a huge con, it can only hit units in the front-row meaning that boosters and supporters are still safe from Blaster Blade Liberator's sword. Also, it's worthy to note that this unit does get extra support specifically for him in both Wingal Liberator and Barcgal Liberator as well. In short, this card has potential, but until his support comes out, he, unfortunately, falls shy of my perfect rating. Next time: See y'all at New York for the Regional Championships!